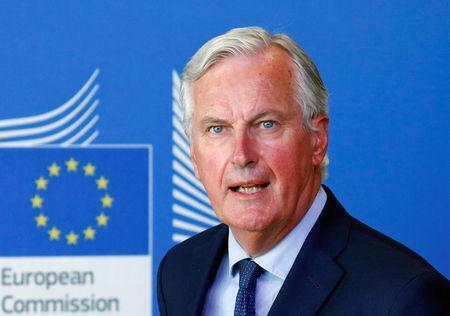 MADRID (Reuters) - Talks between the European Union and Britain on Brexit are being conducted in a spirit of "good cooperation", Michel Barnier, the EU's chief negotiator on the issue, said on Monday. Barnier spoke before meeting Spanish Prime Minister Pedro Sanchez and Foreign Minister Josep Borrell in Madrid to discuss the state of negotiations on Britain's departure from the EU. "We continue working in a spirit of good cooperation," Barnier told reporters as he left the Foreign Ministry. Despite Barnier's upbeat mood, there is, so far, no full exit agreement and some rebels in British Prime Minister Theresa May's Conservative Party have threatened to vote down a deal if she clinches one with the EU. Barnier also discussed the matter of Gibraltar, a British territory on Spain's southern coast which will leave the EU along with the UK on March 29 next year. Although Gibraltar is not part of the EU customs union, businesses fear regulation of the border could become more rigid following Britain's exit from the EU, with detrimental effects for the thriving economy of the tiny territory. In a statement on Monday evening, the Spanish government reiterated on Monday evening that Gibraltar should not become "the latest hurdle to close the Brexit negotiations". "Spain's prime minister and the EU's chief Brexit negotiator agreed to maintain the current timetable that foresees finalising the Brexit negotiations before the European (Union) summit in October," the statement said.